What powerful and passionate words these are of St Patrick as he describes life lived through the invocation of the Trinity! It has been a great joy to work once again with Tim Ruffer, Head of Publishing at the Royal School of Church Music and to share in his enthusiasm and encouragement for this collection. Prayer was the daily rhythm which marked these people’s lives— prayers from dawn to dusk, prayers for the night, prayers from birth to death. These people of the Isles lived quite naturally in a state of prayer. They recognised God as Trinity—Father, Son and Sacred Spirit which gave an immediate and deeply rooted spiritual reality to their lives that permeated everything they did. As we began to go through some of the prayers, I was caught and held by the beauty of these verses and by the rhythmic vitality which pulsated through them. I began to be aware of the mystery which was rooted in this ‘down to earth’ spirituality, and I found it is very bound up in the ordinary and familiar. There was a sense of the sacred in the most ordinary and mundane things that they did like kindling a re, bathing a baby, cooking a meal, growing the food that they ate and so on. To quote Elizabeth Barrett Browning, ‘they saw earth crammed with heaven, and every common bush a re with God.’ All was seem as gift and an offering in gratitude to God. As I began to set these sacred words to music I realised that I was standing on Holy Ground; I had to keep reminding myself of this oral tradition of simplicity which would enable the words to be easily picked up, memorised and taken into the heart thus becoming prayer. Most of the music I have set is very simple indeed. Some is in a chant-like mode or set as a straight verse mode. Some of the chants I have written endeavour to echo the rhythmic strands which I found woven into the fabric of the words. I found that this blended our own heart beat with God’s eternal pulse deep within our being. Some of the chants and prayers have been enriched with instrumental variations which pick up and develop the underlying prayer, bringing in a new voice to proclaim our gratitude and love of God. The eighteen pieces on this CD are made up of four choral pieces with organ (keyboard), three SATB ‘a cappella’ pieces and eleven choral pieces with organ (keyboard) and optional instrumental accompaniment. Many of these pieces are very simple indeed and could be sung by the smallest of parish choirs adapting where necessary. 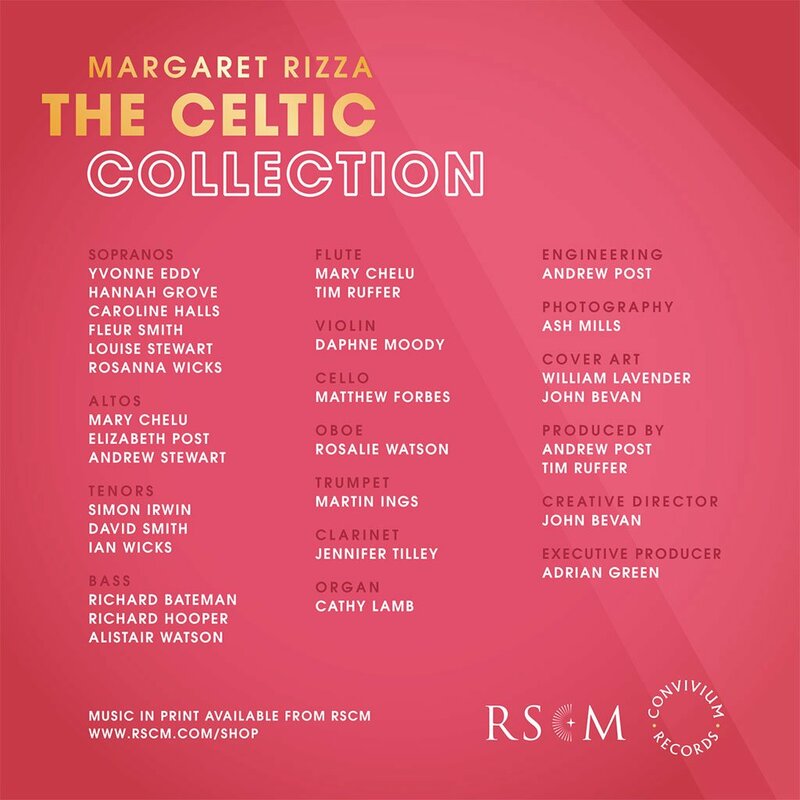 The collection opens with A Celtic Blessing. I have set this opening chant in a traditional chant mode. It is scored for SATB, organ and instrumental accompaniment and opens with an instrumental interlude. The blessing is first introduced by a solo soprano which is then taken up by the whole choir, and the chant continues to alternate between the choir chanting the words and the instrumental variations response to the blessing. This is a chant which I wrote for my first grandchild, Samuel and I remember when the family gathered round his little crib and we listened to the music. He lay there, so tiny, so beautiful, and so vulnerable. We were all embraced in this musical blessing and became part of the sacred mystery of new life. David Adam provides the words to Circle me, Lord, which put me very much in touch with a Trinitarian cosmic dance. There is the inner and outward flow of the circling as the voices and instruments playfully intermingle with each other. The prayer is for protection and hope, keeping danger and doubt afar. It is scored for SATB, organ and a melody instrument. May God shield me is a prayer of great simplicity asking humbly for God to shield me, to keep me, to watch me and to fill me. There is an introduction with cello and violin as a preparation for the choir who enter ‘a cappella’, the sopranos introducing the prayer with the rest of the choir humming in support. The prayer then gathers momentum in asking to be taken to the land of peace; to the peace of eternity. A clarinet begins an extended solo expressing the longing of the prayer with the choir humming in support and culminates in a full choral crescendo before the choir returns again to the initial prayer. It is dedicated to my daughter, Janie. David Adam provides the words Awaken me, Lord, this time to a prayer asking to be awakened, awakened to the light, and to have eyes opened to the presence of the Lord. The flute in this introduction suggests a slow and almost reluctant awakening but as the choir gains momentum they sing of awakening to the Lord’s love and to have their hearts open to His indwelling. In continuing passages the flute expresses new awakenings, and the choir responds with new affirmation asking that minds be open to the Lord’s life, to His abiding, to His purpose and to His guiding. The prayer concludes with repeated echoes to be awakened. It is scored for SATB, organ and a melody instrument. Working with chants one can be very adventurous and work on variety. It is lovely to hear the different voices being highlighted: sometimes male; sometimes female; sometimes solo; sometimes children’s voices; and then to hear the different colours of the various instruments—all facets of God’s life, love and beauty—being revealed, poured out and manifested through our musical gifts. In the Lord is a very simple chant affirming the gift and joy of our salvation. The Lord gives light to his creation and brings peace and true consolation. 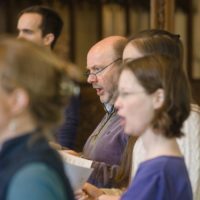 Singing chants can be sung very simply indeed even by the smallest of groups and, as with all chants, they can be adapted and used in many different ways—singing in unison or SATB. Or, the chant can be expanded to incorporate much larger forces who have more diverse musical resources at their disposal. In this chant the instruments play an important part in responding to the choir which supports the instrumental variations. As the instruments play you will hear the choir either prayerfully praying the words or humming or using an open‘Ah’.The instruments,playing their various variations, respond to this with a fresh voice enriching and confirming the prayer which underpins their playing. Chants can be as short as 2–3 minutes long or expanded if necessary to 8–10 minutes long; it depends on the occasion so there is much flexibility which is very helpful. I have found chanting to be a wonderful way of prayer. So, we begin the chant in the head and after some repetition the words sink down into the heart making that longest journey in the world—from head to heart and so prayer begins. Be gentle when you touch bread is a beautiful prayer given to me by Tim Ruffer. This, and one other of the other prayers in this collection, are from a collection used during the Trinity season at St Mary’s Church, Fordingbridge, put together by Revd Mark Godson. I found that in this prayer I was caught by the the fragile simplicity of the words and yet at a deeper level I was drawn into the powerful mystery of the Eucharist. It led me first to think about gentleness and the role it plays in my own life; the times when it is hard to be gentle, when one does not have time to be gentle and when it is easier to be in control rather than being ‘other-centered.’ The prayer speaks of the beauty of such an ordinary thing as daily bread which is touched by sun and soil, by the beauty of patient and loving toil; by winds and rain caressing it and by Christ blessing it. As I found the prayer deepening within me, the words of Jesus entered into my mind from the Gospel of John 6: 47–51—words which bring one into the mystery, the awesomeness, the gratitude and giftedness of the Eucharist. The prayer continues and in the second verse it brings in the joy and beauty of wine. The music is set in a very simple way opening with a meditative fragment on the organ. The choir enters ‘a cappella’ reminding us to be gentle when we touch bread but never to leave it uncared for, or taken for granted, or unwanted. The music explores the many threads woven into the prayer using full and varied choral participation, and ends with contemplative thoughts on the significance of the prayer. I have dedicated this work to Tim Ruffer. The Lightener of the stars starts with praising God, the Lightener of the stars, the transcendent God, who is in heaven on the crests of the clouds. The choristers of the sky are coming down from above to laud Him, to praise Him, as they descend to meet with the imminent God in Christ here on earth, the refuge of love. It is a prayer of loving praise, thanksgiving and celebration. It is scored for solo voice, SATB and organ and opens with a solo voice declaring, in fragmentary mode, the heavenly wonders in the world above. Once earth bound the full choir is brought in to give praise and glory to God. The prayer ends with a recapitulation of the first introductory phrase, ‘Behold the Lightener of the stars on the crest of the clouds,‘which gradually dies away in the distance. Another prayer of praise, thanksgiving and proclaiming God’s goodness, Jesu, meet it were to praise him is scored for SATB, organ and instruments. I have added a metallophone (chimes), giving a luminous glow and extra little chinks of bright light to this introductory passage which is joined by a humming choir. Finally, the sopranos invite all to join in singing their praises and gratitude to Jesu. The first verse extols God’s creation, proclaiming that all is full of his virtue; all is full of his blessings. After a brief instrumental passage, unison voices again persuade us to sing our praises as in the introduction. The second verse tells us that there is no life in the sea, no creature in the river, nothing in the firmament but proclaims his glory. Again—as in the introduction—praises are sung with gratitude and this brings us into the last verse which proclaims that there is nothing beneath the sun but proclaims his goodness. This leads to a climatic build up and ends in praise and jubilation. Very simply set as an SATB ‘a cappella’ anthem, here the words of Hymn of St Patrick burn with love, joy and praise for all that Christ is for St Patrick. It is a prayer of wonderful affirmation and deep understanding that God in Christ was deep within his being; who lived him, who breathed him and who sustained every moment of his life. I have set this as a Taizé–like chant for SATB, organ and instruments including a trumpet. It is very traditional in style and gives a choir much opportunity for very full choral singing. There is much variety in the various combinations of choral writing, of instrumental variations and there is a very big climatic ending. Christ as a light is a very simple four part ‘a cappella’ choral anthem. The text by St Patrick reveals a very beautiful simplicity and humility which has inspired the choral writing. There is also a version for women’s voices only. The introduction here is rooted in the introductory words: O Being of life! O Being of peace! O Being of Time! O Being of Eternity. These words expand into full supplication, an entreating of requests for our daily living. The prayer deepens and pleads to be relieved of distress, to be enfolded by love and to be enriched by grace. I have set it for SATB and organ. The introduction opens with sopranos singing the opening words. The prayer unfolds, first by the Tenors and Basses praying their petitions, and then joined by the full choir. The middle section is ‘a cappella,’ as deep human needs are laid bare. I felt that there needed to be an unadorned beauty and fragility in this verse—being unaccompanied—which could express more poignantly the deeper meaning of the words. This leads into a full choral supplication which concludes with a recapitulation of the opening words, O Being of life. God with me lying down is prayer to again con rm the deep faith of these Celtic people who put their trust in a God who was deeply rooted within them. It was a deep personal relationship founded on trust and a realization that whatever they were doing, wherever they were, however fallen they became, this living Spirit of God was actually part of and deeply grounded in love within their being. God with me lying down is a prayer of deep acclamation as they express their gratitude for all that God is for them. It is scored for SATB, organ and instrumental accompaniment. It opens with a melody instrument playing an introduction which introduces the sopranos singing words of the first verse which is then taken up by the whole choir. This leads to an instrumental passage which expresses in another light the words which were sung, and to the following verse—unaccompanied— to give clarity and transparency to the closeness of God in our sleeping and in our waking—every day and every night. The piece follows with a full choral richness of praise, thanksgiving and affirmation of the love of God, and concludes with a peaceful ‘Amen’. For Gaelic Blessing, I wanted to write a traditional chant and set in a conventional way, making it very easy to learn and which, together, with the other chants in this collection, can to be used for many occasions such as services for healing, prayer, thanksgiving, the Eucharist or even for a marriage or baptism service. It is set in the usual way for SATB, organ and instrumental variations which provide a wealth of variety as the voices and the instruments mingle with each other both affirming the blessings and the words of the prayer. It is dedicated to Mattie, my third grandchild. I have scored Prayer of St Patrick for SATB, organ and instruments, again using a metallophone chimes) as it is such an intrinsic part of this music. The words echo very much the words of the Hymn of St Patrick, which comes earlier in this collection. The prayer opens with just the chimes only establishing a four bar pattern which continues throughout the piece. It is as if we tune into it at a specifc moment but it has always been there and will always be there. It is expressing God’s heart beat which goes on within each one of us whether we are aware of it or not. After these four bars the choir enter with the sopranos singing the words Jesu, Domine which are underpinned by the choir humming. The tenors and basses are the first to sing the first short verse. This is followed by the entrance of an instrument, again with the underlying hum from the choir. It is then followed by two instruments in duet with each other. The piece continues in this ongoing way, choir and instruments interweaving with each other in many different ways but always with the chimes pulsing away—beneath, below, above, around, without, within—always with the steady and unchanging pulse holding everything together. It concludes with the repetition of Jesu, Domine. After the birth of a baby there would be a ritual conducted by the midwife for the first Birth Baptism. The following are the words of a midwife spoken to Alexander Carmichael as he collected these wonderful narratives of the Celtic people he met. put the third little drop in the name of the Spirit, and the watching–women say ‘Amen’. What we have here is a little ‘scena’! 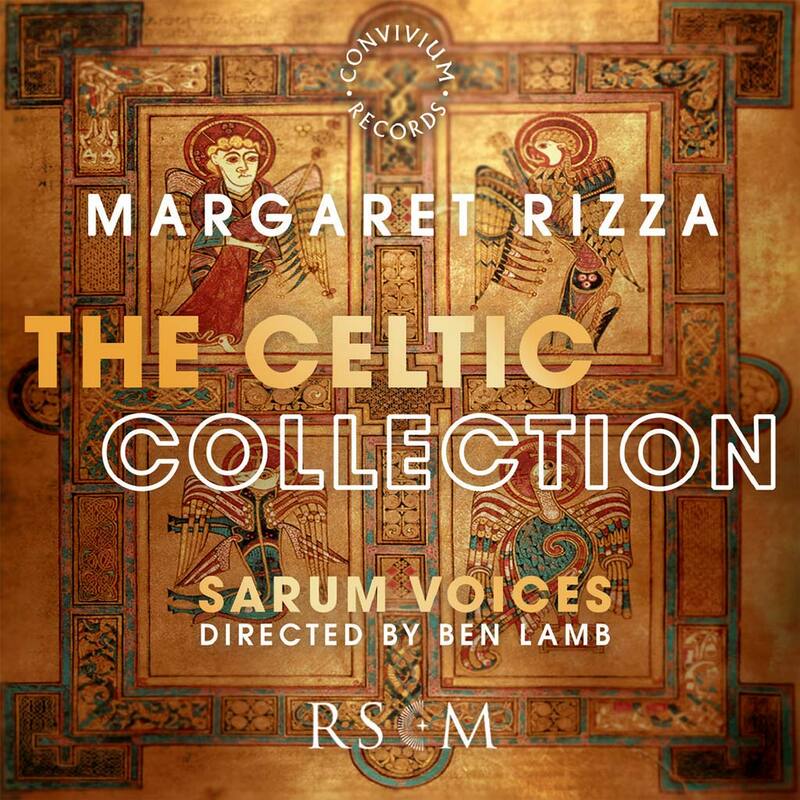 In setting the music to these words Celtic birth baptism, I have followed the narrative which has developed into two little scenes.The first with the midwife (solo soprano/ mezzo soprano) and her assistants, the three watching women, (sopranos). The midwife’s music is treated in a recitative style with the responding watching women singing the Amens in triads. The second scene is of the household, full SATB choir and their response to the birth of this new life—prayers against harm, the harm of the fays, the host, the gnome, the spectre. They then call down the blessings of the Trinity. It ends with a jubilant and celebratory, ‘Amen.’ It is dedicated to my second grandchild, Benjamin. Enfolding is a very simple and reflective prayer meditating on the spirit of God who is within my speaking, within my thinking, enfolding me and surrounding me and who is deep within all aspects of my life. It is scored for SATB, organ and instruments. Finally on this disc, Trinity Blessing was the very beautiful blessing which ended the Fordingbridge collection. I have written it as an ‘a cappella’ piece for full SATB participation. Sarum Voices was born out of necessity when a visiting choir failed to arrive at Salisbury Cathedral. Such fun was had on their first outing that other performance opportunities were sought, and the choir has now recorded numerous CDs (notably Juxta Crucem and A Ceremony of Carols, both of which received rave reviews on BBC radio 3), toured Europe and South America, and performs regularly in Salisbury and across the country for weddings and concerts. 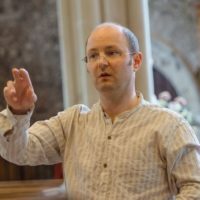 Many of our singers were originally choristers at Salisbury Cathedral, but over the years we have broadened the net to include other like- minded musicians. For several years we have made Sarum St Martin our spiritual home, and we return to the church for at least one concert per year, and is our recording venue of choice.